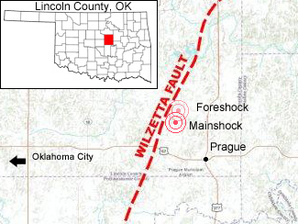 The above map shows the Wilzetta Fault, which ruptured in a magnitude-5.6 earthquake Nov. 5, 2011. The foreshock, which happened 21 hours earlier was a magnitude 4.7. Map information was gathered from the Oklahoma Geological Survey and U.S. Geological Survey. "We're continuing to look at it. It's a little different than what's happened in these other states," said Corporation Commissioner Dana Murphy, who leads the panel. "There's been injection activity in this area for a long time. And there's naturally occurring earthquakes here." University of Oklahoma seismologist Katie Keranen sees "a compelling link" between wastewater injection and earthquakes. Photo courtesy of the University of Oklahoma. It was just a few minutes before 11 on a Saturday night when the earthquake struck. John and Jerri Loveland had just finished watching Oklahoma State University beat Kansas State in football. 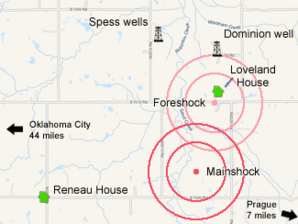 The above map shows the location of the home of Jerri and John Loveland and Joe and Mary Reneau, along with the site of New Dominion's Wilzetta disposal well, and two nearby wells operated by Spess Oil. Map information was gathered from the Oklahoma Corporation Commission and news research. It would not be the biggest U.S. earthquake suspected of being triggered by oil and gas activities. According to a recent National Research Council report, that would be a magnitude-6.5 earthquake in 1983 near Coalinga, Calif., that injured 94 people. Researchers have linked it to oil extraction. Jean Antonides' voice has taken on a rare mocking tone. Austin Holland is not an elected official or an oil and gas regulator. He's not the head of the Oklahoma Geological Survey. But as the main seismologist at OGS, Holland has come to be the face of the state's response to the November earthquake and the chief critic of the idea that it was caused by drilling. At a town meeting about a week after the quake, he downplayed the possibility that it might have been caused by saltwater injection wells. He has appeared on local television news to explain why it couldn't have been caused by oil and gas. He's done presentations for local groups, such as one in June to the Natural Gas & Energy Association of Oklahoma, on his thinking about the causes of the quake. Oklahoma Geological Survey seismologist Austin Holland has come to be the face of the state's response to the November earthquake and the chief critic of the idea that it was caused by drilling. Photo courtesy of Austin Holland. And without his say-so, or that of his agency, Oklahoma is not going to recognize any link between drilling activities and the earthquake. The Corporation Commission has been deferring to the judgment of OGS on the cause. Officially, Holland's position, and that of OGS, is that the commission is still examining data eight months after the quake and has yet to reach a conclusion. "I don't think the evidence is there at the moment," Holland said in a June interview that interrupted his preparation for the presentation to the natural gas group. "It's going to take a long time to really evaluate these things. Certainly it's not definitive one way or the other." But Holland is dismissive of the research by scientists who do see a link between drilling and injection, both in Oklahoma and in other states. "You couldn't have an earthquake in Oklahoma that wasn't close to a reservoir or a production well or an injection well," Holland said. "Pretty soon, all your earthquakes are induced." In Oklahoma, he says USGS made too much of the "remarkable" increase in the number of earthquakes when deeming the surge "almost certainly man-made." "I was a little surprised that so much emphasis was put on this," Holland said. In Ohio, he said, the state's determination that the earthquake was likely triggered was based on weak evidence. "What you have is maybe a reasonable hypothesis," he said. "In Arkansas, the earthquakes were naturally going to become less and less," Holland said. "That's why I think their knee-jerk reaction was counterproductive, because by shutting down, they may never know" whether the earthquake swarm was triggered by injection wells, he said. "If they continued injecting and [earthquakes] ramped back up again, then you would have had this clear sign." Holland also rejects the conventional wisdom that injection of drilling brine should be forbidden near active faults capable of damaging earthquakes. "By understanding this sequence, we have a potential to avert others, to mitigate these things in the future," he said. Murphy, the head of the Corporation Commission, notes that state officials will also be able to take advantage of a seismic survey done in the area shortly after the earthquake by a company looking for oil. Holland's findings line him up firmly with Antonides, New Dominion and the state's dominant industry. That has set some, such as Joe Reneau, to grumbling. "I don't want to say he's been bought off by the oil companies, but he's withholding his position on it," Reneau said. "I choose to believe he's a cautious man." Holland says he knows that some have expressed such sentiments, but he brushes them off. He could work for industry if he wanted, he says, and make a lot more money. But he's chosen not to. "There are people who have accused me of being in the pocket of industry," he said. "I tell them, if I was working for industry, I'd be in a whole different ballpark." Driving by the flat fields around Prague, down gravel roads straight as a rifle shot, the signs of the earthquake are no longer easy to see. The buckled highway was smoothed over the same day. Weeds have grown over cracks in the ground that were alarmingly visible the day of the quake. The new concrete driveway in front of the Reneaus' house sparkles bright white in the summer sun. They moved back into their house in June from the mobile home on their property while the house was repaired with about $200,000 from their earthquake insurance. Joe Reneau bought the insurance policy a few years ago after earthquakes started rattling Oklahoma City's eastern suburbs and after one shook their house in February 2010. But shortly before the November earthquake, they had gotten a notice that the policy would be canceled Dec. 1, 2011. The quake happened just in time. "I won the earthquake lottery," he quipped. Now, though, the annual premium has risen from $25 to $600. And that's for a lot less coverage. The new policy has 18 pages of exclusions, and their deductible has gone up fivefold, from 2 percent to 10 percent of the value of the house. If there is a next time, it will cost a lot more to rebuild and might not be worth it. Some companies have stopped offering any new quake coverage in the state. Regulatory filings indicate American Property and Casualty Co. and American National General Insurance Co. are withdrawing earthquake coverage in the state due to "increased hazard." Jerri Loveland didn't win the earthquake lottery. Like many people in the area, she and her husband didn't have earthquake insurance. Soon, she might not even have homeowners insurance. A contractor told them it would cost $40,000 to $60,000 to put her house back the way it was. Homeowners insurance wouldn't cover it. And in a bitter twist, they then found out her insurance company, Republic Group, had decided to pull out of Oklahoma. So they need to get new insurance by September. But her agent told them they can't get it until the house gets fixed. Outside the house, the biggest reminder of the earthquake is what's not there: the chimney. There's construction wrap over the hole it left in the side of the house. The paper wrap serves as a wall of their daughter's new bedroom, which had been the living room. They've abandoned the upstairs where their children used to sleep, cutting their living space in half. They got some help from their church and used their tax refund to buy supplies for a few repairs. They applied for a Small Business Administration loan, she said, but were rejected. She explains all this while preparing for a family trip to the doctor's office on a recent June morning, in knee-length jean shorts and a T-shirt, with her hair pulled back. Her husband crushed his arm in a machine at work, adding to their hard-luck tale of the past year. Out front, on the graded gravel road, is a small, hand-scrawled sign stuck in the weeds saying, "Eggs for sale." She sells the eggs for $2 a dozen to passers-by. Neither that nor her husband's workers' compensation checks will put her house back together. "I don't think our chickens can lay that many eggs," she said. Tomorrow: State officials ignore advice about injecting into faults.